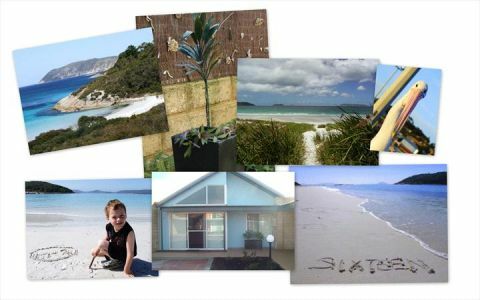 Situated on Marine Terrace just 150 metres from the white sands of Middleton Beach, Waves Luxury Beach House Accommodation is the perfect location to enjoy a holiday with family or friends. 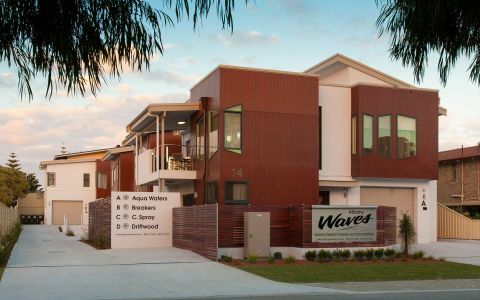 Featuring four architecturally designed luxury beach houses, each custom built with a unique purpose, Albany Waves provides ideal holiday accommodation for families, couples and people with a mobility impairment requiring wheelchair access. These beach houses are vibrant, stylish and beautifully appointed. 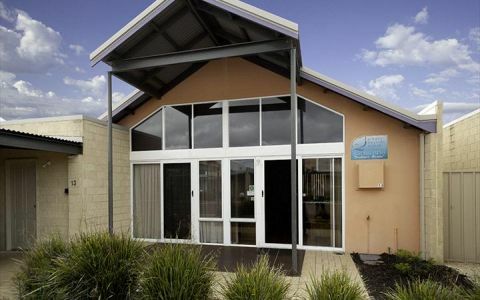 Our fully self contained 2 storey, 3 bedroom units have been designed to provide the ultimate in comfort and privacy, each uniquely decorated with quality furnishings and fitted with superior beds, luxury linen, fully equipped Smeg kitchens, plus flat screen televisions, dvd's and cd players for your enjoyment. Close to cafe's, bars and beachfront amenities. 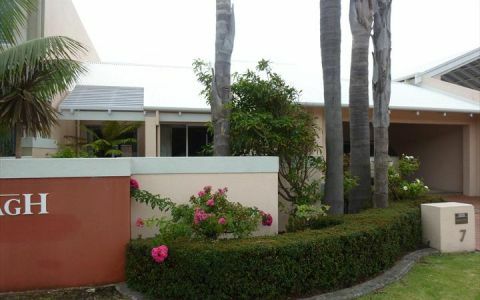 2 storey beach house, 1 king bedroom plus ensuite with free standing bath, 2 queen bedrooms (ground floor), retreat with queen sofa bed, fully equipped Smeg kitchen with dishwasher, laundry with combination washer/dryer, bathroom with toilet, powder room, split system air conditioning, 3 flat screen televisions, balcony with bbq, secure garage, free Wifi. 2 storey beach house designed purely for adults, 2 king size master bedrooms with spa bath ensuites, contemporary style with quality furnishings and fittings, fully equipped Smeg kitchen, formal dining, spacious upstairs living area, downstairs retreat (optional 3rd bedroom with queen size sofa bed), split system air conditioning, laundry with combination washer/dryer, balcony with bbq, secure garage, free Wifi. 2 storey beach house, 1 king bedroom plus ensuite with freestanding bath, 1 queen bedroom, 1 double room with 2 king single beds, retreat with queen sofa bed, fully equipped Smeg kitchen with dishwasher, laundry with combination washer/dryer, bathroom with toilet, powder room, split system air conditioning, 3 flat screen televisions, balcony with bbq, secure garage, free Wifi. 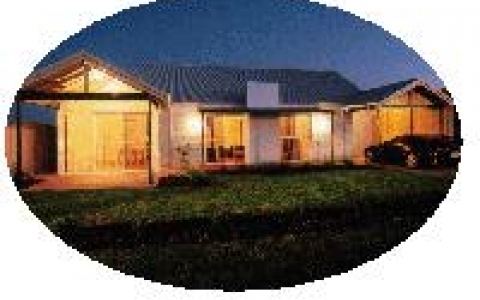 2 storey beach house with wheelchair access and lift with telephone, master bedroom with king bed, 2nd bedroom with queen bed, 3rd bedroom with 2 extra long king singles, downstairs retreat with queen sofa bed, larger living spaces and wider doorways for easy access, disabled bathrooms with safety rails, 3 toilets, fully equipped Smeg kitchen, flat screen televisions, laundry with combination washer/dryer, split system air conditioning, balcony with bbq, secure garage, free Wifi. Cancellations must be received more than 14 days prior to arrival with peak holiday periods requiring a minimum of 28 days notice. Cancellations not received within the above times will result in the forfeit of your first nights booking fee. The balance of your booking fee will be refunded. We may consider a change of booking for cancellations if notification is received 28 days prior to the original booking date. All changes in booking are subject to availability and any price increases that may have occurred between the time of the original booking and the new booking date. There is no refund for early or unscheduled departure under any circumstances. should you make a booking and not arrive on the day you will be charged 100% of your booking tariff. In addition there will be a $62 Albany Visitors Centre cancellation fee. Continue on Albany Highway through to the first large main roundabout until you reach the York St monument roundabout. Take the 2nd exit into St. Emily Way, then left onto Middleton Rd, follow this road towards Middleton Beach and then turn right into Marine Terrace.